I first saw Martin Rosol's work on the Holsten Galleries web site back in early 2000. I was immediately struck by the similarity of Martin's work to the works of Jon Kuhn... however, unlike Kuhn's works, which are often very complicated in structure on the inside, Martin's works were extremely simple, but elegant, in design. When I visited Josh Simpson in August 2000 and mentioned Martin, Josh informed me that Martin lived "just around the corner"... literally, just a few miles away. Although I could not visit Martin at that time, I resolved to visit his studio the next time I visited Massachusetts. 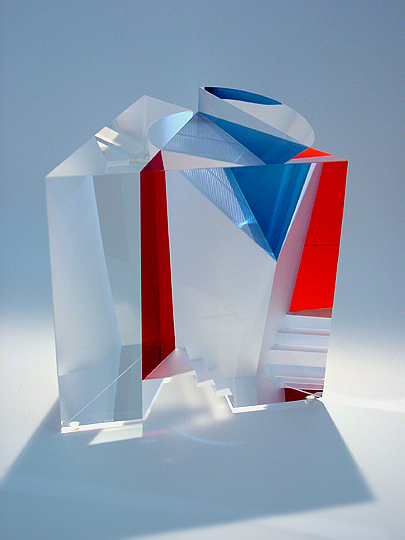 Cut to May 2001, my trip to New England to visit glass artists: Due to a sudden change in plans, I found myself with not much to do on my first day in Massachusetts... so, I decided to visit Holsten Galleries for the first time. When I arrived there, they had four of Martin's works on display, and were anticipating the arrival of several more works to be shown at the SOFA Expo show in New York. Knowing that more works were soon to be available, but also knowing that I would not be able to see them in the gallery due to my travel schedule, Jim Schantz, the director of the gallery, called Martin and let him know that I wanted to meet him while I was visiting Josh. So, the next day, Martin picked me up from Josh's studio and took me to see HIS studio, not far away. The new works for SOFA Expo were already boxed up for transport, but Martin unboxed a few of them so that I could see all of the different forms and color combinations. This work really caught my eye... it was the first one that Martin showed me, and the one I liked the best of all of them, so I decided to acquire it from him. The overall form of this work is fairly simple... it's a column whose cross section is very nearly in the shape of an equilateral triangle. It contains an inner cavity in the shape of a truncated half-cone, with an angled section marked by a set of sandblasted lines. 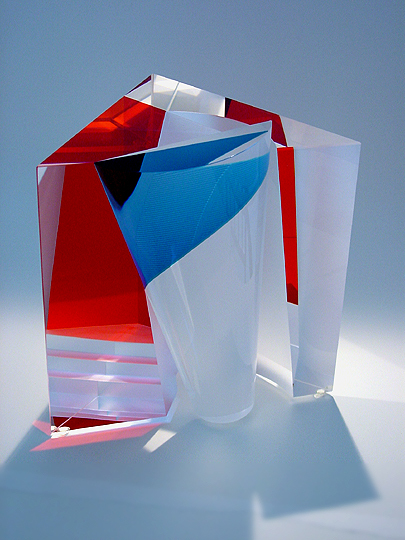 The front of the work features a truncated half-cone of glass, similar in shape to that of the cavity within the work. The work itself is made of three separate pieces of optical glass... the half-cone, the main body to the left of the cavity, and the main body to the right of the cavity. (It's not possible to properly form the interior cavity using only one piece of glass... also, the design of the coloring depends on having two seams between pieces of glass.) The coloring of the work is fairly simple, as well... the seam where the half-cone is connected to the main body contains blue color, and the seam where the two main body pieces are connected contains red color. Finally, there is a set of "steps" carved into the back of the work. The result of all of this is VERY cool. Because of the nature of the optical glass, numerous reflections of color appear both from the outside, and on the interior facets of the work... basically, you see a lot more color than actually exists. The additional surface features, such as the steps and the sandblasted grid, also appear in places where they don't actually exist, as well as overlaid with color. If you get in just the right viewing angle and move just a few inches, colors and features appear or disappear. 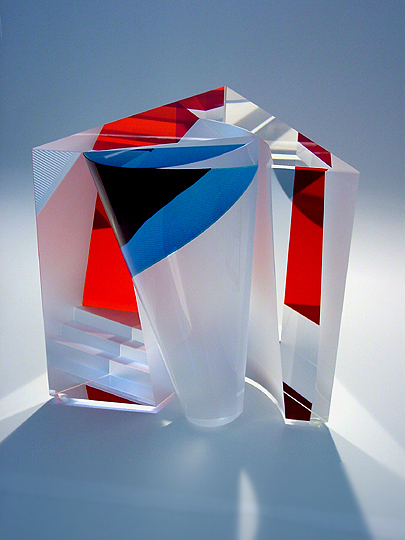 I've always been a fan of the use of optical glass... Martin has definitely figured out how to combine clean, simple design with minimal use of color to create wonderful works of art. Incredible.